The Bride's Year is a tale of a cynical little angel who dislikes humans and the concept of time. God sent this angel to earth to learn about the mystical year of synchronic time and about His Betrothed, the Church of Christ. My writing offers readers a fresh way of looking at and learning about orthodox Christianity. The style is intended to help the mind and heart overcome old prejudices and awaken them to the Truth of God’s plan for the human-gods that were created in His image and likeness. I quietly slipped away from Plymouth and Phineas leaving the Pilgrims to their strenuous but faithful lives. There were many more angels helping them there than I had seen anywhere else, even in heaven, so I knew I was leaving them in good hands to build new lives for themselves and a brand new country. I knew exactly where to go next in the Bride's year and I could not wait another minute to get started. Alone and unafraid I headed up to the North Pole to visit Santa Claus whose feast day is on December 6th. I had so many questions to ask him. I wondered how this one saint among the thousands of disciples of Jesus could have gained such fame, even among the heathen. I wanted to know why he was associated so closely with the incarnation, and if he received half as many thank you notes as he did letters of request. So off I went north past Maine, through Canada and westward to North Pole, Alaska. When I landed I went right into a church looking for angels who might know where to find Saint Nick. The church was empty so I went back out into the streets. People were few and far between in North Pole. Suddenly, a tall frozen angel scared me when he shouted, "Can I help you?" "Oh! I replied, I thought you were a statue! You frightened me!" "I'm looking for Santa Claus." He replied, "Santa Claus lives in the real North Pole; this is Alaska. Go north 30 degrees and west 20 degrees. Look for the red building; you can't miss it. Farewell!" "Thank you!" and off I went over white mountains and across glaciers. It was easy to spot the bright red building nestled in a valley of freshly fallen snow. There appeared to be two chimneys jutting out of the red metal roof, one with a steady stream of smoke and the other with a spotlight beaming out from it, as if Santa lived in a lighthouse. I entered to find a red cheeked old man with long white whiskers and white hair wearing a fleecy red gown trimmed in white fur sitting by a fire. His eyes were closed. He appeared to be alternating between praying and listening. After a few minutes, he sensed my presence and opened his eyes. "May I help you? he asked. "Santa, " I replied cautiously for fear of interrupting him, "I am traveling on the flat circle of The Church year to learn how time and matter can be holy. May I talk with you on this, your feast day? I know how busy you are, so I promise to keep it brief." Santa's face lit up. As a man who lives to be of service to others, he relished the opportunity to help me. Old Saint Nick immediately stood up, fetched a nearby rocker and carefully placed it beside his near the blazing hearth. Then he sat himself down, and with bright cheerful green eyes said, "Let's talk." Jumping right in with my questions, I asked, "Santa, why do you live in this frozen barren place instead of in heaven where most of the other saints go to live?" "Yes, in a sense I do. I pray child by child that he or she will receive whatever their hearts desire. Often their angels." Santa paused briefly to look at me, wondering why I wasn't guarding anyone, "send me messages of what they want or need, and then I get to work praying that someone, a parent or an uncle will give them whatever it is. You see, for a child to receive the gift of what they want is the first step to showing them that God can answer their prayers." "Do you have a wife and elves?" "The Lord has sent me many many helpers to bring me children's wishes and to send my prayers to those who can fulfill them. A tremendous amount of research goes into my job. My wife manages the elves and they all live in the building down the way. They know I must be alone to do my job properly, and they must live in community to do theirs. We worship together twice a day." "Can you tell me why, of all the saints who ever lived, why you are the most famous, and why you are tied to Christmastime?" With this question Santa seemed to drift farther into a very distant memory. He was quiet for some time, forcing me to practice patience. Finally he said, "When I lived among the people I was a most fervent defender of the faith. You see, my Lord and Savior, Jesus Christ, appeared to me at a young age. He became my best friend. Even as I grew into an old man with much responsibility, I never lost the Friend of my youth. It never mattered to me that Christ was invisible because He revealed himself to me in many very real ways: guidance and healing and by answering my prayers. During my days as archbishop of Myra, I was asked to attend a council because there had been many far flung opinions about who Jesus Christ was. Some said that He was more human than divine, and others said He was more divine than human. Obviously, those people didn't know Him as I did. He once told me that because He is Perfectly human, He is divine. He said that mankind lost its divinity, its image of God, when Eve ate of the fruit of the tree of the knowledge of good and evil. He said that He wanted to help us become fully human, so we too could be fully divine again. There was one man, a fellow named Arias who irritated me to no end. He was so cocky and so wrong. It was as if he thought he could make Jesus into whoever he wanted him to be without any regard for the truth. I despised him for spreading lies about my best Friend, and gathering a clan of fellow misbelievers with him. He tried to validate his opinion with votes as if the truth was powerless against majority rule!" I could see Santa's face getting redder and redder. "These people didn't know Christ, my Lord!" ! I became so angry with his lame arguments that I punched Arias in the face right then and there, on the floor of the council! He fell of course which quieted him down, and I walked away to brood and let the others revive him. Jesus Christ as His Holy Spirit, and my Best Friend, came to help me. I was surprised that He was so pleased with me. Jesus knew then and there how much I loved Him and that He could trust me to be His friend forever. To console me, He promised to find a way to thank me for defending Him. I went about my business without a second thought about that incident, doing what I loved to do the most, which was to give gifts to young and old, when it occurred to me that I could never give a better gift than God did when He sent us His only begotten Son to earth to restore the relationship of humankind to our Creator and Father, and to make us divine too. Since that day, I have tried to be like my Best Friend by giving of myself, and giving everything I can. The season of giving naturally linked me to the true gift giver, our Father. I have wondered if my fame is His reward for defending Him against Arias. The reward is the opportunity to bring joy to children as a little step toward their personal revelation of the gift of Christ." "You really are such a jolly old chap. Don't you ever get sad?" I asked. "Yes, my angelic friend, I do." he replied, "The saddest thing for me is that unbelievers tell the children I am not real. How can they say that? Surely only the most blind and dumb could think that I am not as alive and real as anyone they can touch!" I thought Saint Nicholas had a very good point. He certainly looked alive to me. I was sorry for reminding him of his pain, so I added, "Santa Claus?" "Yes, my friend." He said. "I can help you transport your prayers for the children's gifts this Christmas. There must be quite a lot to do. Where do I begin?" 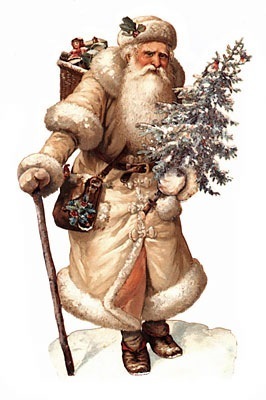 Santa smiled warmly and with his sparkling eyes full of love and grace responded, "Oh my dear friend, you have a mission of your own. Continue on your journey to the manger. My elves will help me. Thank you for stopping by. Peace be with you, now be off, I must get back to my work, only 19 more days to go. Shoo!"